The School of Graduate Studies begins first-term classes in mid-August and again in mid-January. The Committee on Admission utilizes a rolling admission policy; therefore applications are accepted and reviewed on an ongoing basis. The final deadline for receipt of applications and all supporting documentation is June 15 of the current year for the August class and November 15 of the preceding year for the January class. Prospective candidates should note that entering classes are highly competitive and applications completed early have the advantage of being reviewed at the beginning of the admission’s process. The time necessary to secure official transcripts, standardized test scores and letters of recommendation should be taken into consideration. The Committee reserves the right to defer an application to the following semester if there are no available seats. The Office of Admission will acknowledge receipt of the candidate’s application within two weeks of its arrival. A candidate is informed of any more required supporting documents missing at that time. A candidate will receive notice when the application file is complete. Within a month after receipt of the complete application and supporting documentation, the application will be reviewed to determine whether an interview will be granted. The Office of Admission encourages candidates who have been approved for an interview to request interviews in Grenada and will schedule one upon the applicant’s request. 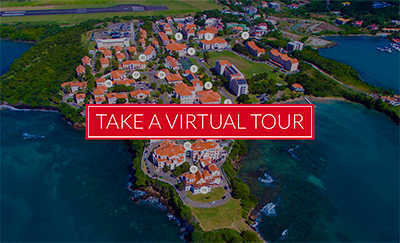 The University recognizes that financial considerations may prevent many candidates who reside great distances from Grenada from choosing this option. Interviews, therefore, may be conducted in the United States, the United Kingdom, Africa, the Middle East, the Far East, the Caribbean or other locations that best serve the diverse applicant pool. A student’s acceptance into a School of Graduate Studies in the School of Medicine is granted upon the presumption by the Committee on Admission that: (1) All courses currently being taken by the applicant will be completed prior to registration. (2) All statements made by the applicant during the admission process, whether oral, written, or in submission of academic documentation, are true and correct. If it is subsequently discovered that false or inaccurate information was submitted, the University may nullify a candidate’s acceptance or, if the student is registered, dismiss the student. The Health Care form must be completed before registration. Within three weeks of acceptance notification, a student must submit a signed Acknowledgment of Admission along with a non-refundable tuition deposit in order to reserve a seat in the class. Begin the Medical PhD admissions process by reviewing the requirements for the Doctor of Medicine program.